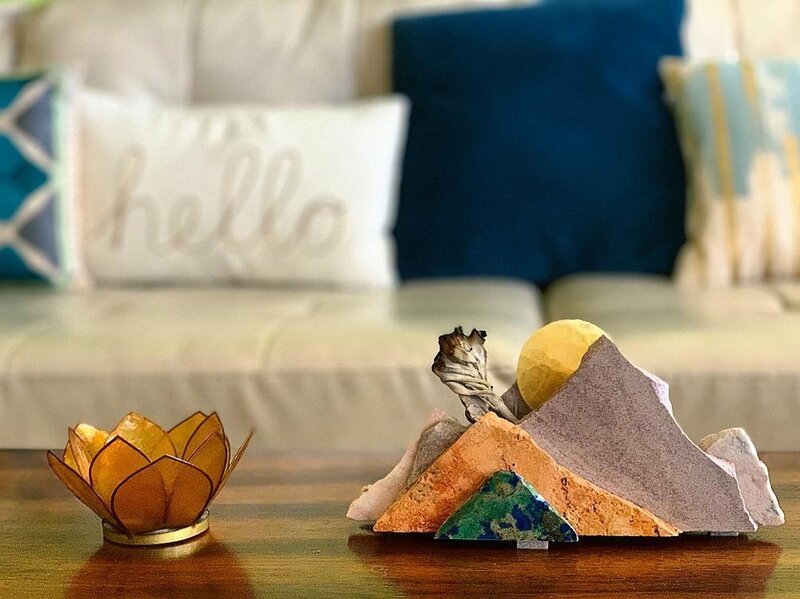 The Abundant Host lives in a city at the foot of the mountains; here, she brings the mountains inside her home with some sage for guests to enjoy. I know, I know, I took a ridiculously long writing hiatus for “the holidays” but I’m back and have New Years Goals in place to write and post more this year! More on that in an upcoming post. If you want to see what I’ve been up to > my month in Hawaii, you can always follow my adventures on Instagram (where I also post sporadically 🤦). Hey I can’t just write about living the life, I actually have to go out and do it, which sometimes results in less working and posting….ahh the life of a Lifestyle Entrepreneur. Well it hasn’t all been surfing and snorkeling with turtles, my latest guest spot on the Best Ever Real Estate Podcast went live two weeks ago. I will add it to my podcasts section with the rest of them if you want to check any out. ZM: Thank you for agreeing to do this interview! Tell us your Airbnb story; how did you first hear about it and what made you decide to try it? 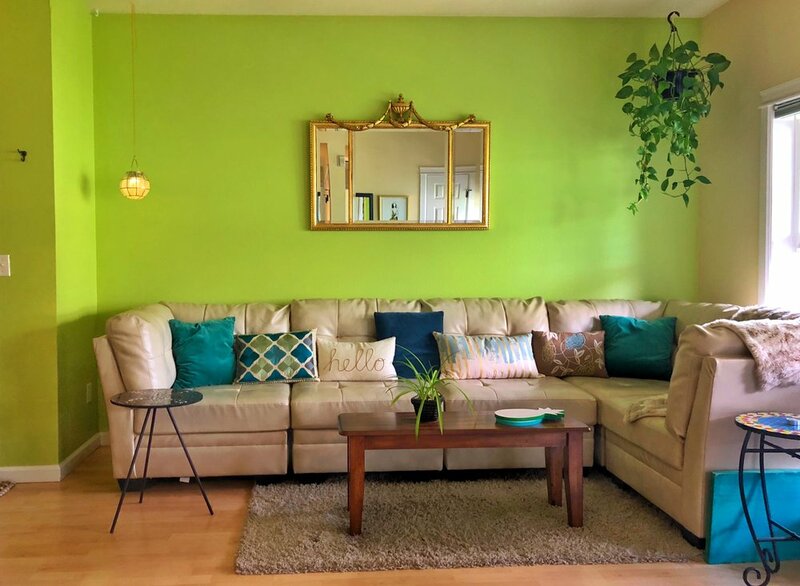 The living room of one of Amy's listings in Boulder, Colo. She says: "The natural world is very important to me; I love that my accent wall is a bright yet nature-based shade of green—it reminds me of a young plant, ready to spring to life. I match my pillows and other objects to it, and of course I love hanging real plants nearby to give the feeling of a modern, organic space." AH: You’re so welcome, Zeona! I first started hosting in Dec. 2013; five years ago as of this interview. I first started using it the way many of us hosts do, by staying as a guest and traveling around to experience different cultures. What made me decide to get into hosting was love. I had just started a relationship with a man who lived in NYC (who I would be with for four years and would become a lifelong soul friend), and I wanted both—I wanted to travel to see him and also travel with him, and I also desperately wanted my own one-bedroom. At first I thought, I’d have to choose. Then, I realized that I had been giving myself my own ultimatum. Neither situation in isolation of the other gave me what I really wanted, which was a nest and sanctuary in a city I adore, and the ability to travel when I wanted at the same time. I was putting restrictions on myself that I had to have one or the other. And if you give yourself an ultimatum—well, you can only have one of the two options! Then, Airbnb gave me the real, tangible possibility to have both, that I hadn’t allowed myself to consider at first. ZM: Where did the idea for The Abundant Host come from? Did you see a need that you wanted to fill? How did you go from just-a-host to lifestyle brand creator/blogger? AH: I started The Abundant Host back in January 2015, and you phrase it well—I did see a need for what I had to offer. I saw a few industry blogs out there at the time that seemed to focus only on money-making, or making a listing look just like a hotel room with no personality or character, or buying up apartment buildings and putting up 80 boring, blanket listings. While the financial benefit is of course an important aspect (and I’m definitely not against having multiple Airbnbs), I do think there’s a lot more to being a host that can make the experience more enjoyable, culturally meaningful, and even magical. I found that I was talking to friends and strangers alike about Airbnb almost everyday of my life, giving advice and talking nonstop about it. People told me I should have a blog for it… and I just poured everything I was sharing with loved ones out my fingers and into The Abundant Host! I then expanded to offer consulting, courses and products for hosts both new and experienced as well, but my core is my blog and the information/inspiration I want to give people to help them get started with intention. ZM: Tell me more about the voice of The Abundant Host site, what is its purpose/message? AH: Haha, so this is pretty bold, but l’ll put it out there—a client of mine once called me “the Brené Brown of Airbnb hosting.” Save for the obvious difference in wild popularity, I realized that was not so far off! My core values for hosting are rooted in connection, vulnerability and authenticity, and how people can truly integrate that into hosting—not only in the design of a listing, but in your communication and presence, as well as considering the cultural effect you have on your surrounding city or neighborhood. Ask yourself: Do your interactions as an Airbnb host benefit your town? How so? This is actually pretty easy to do; I love teaching my clients these small things they can do to put even more love and intention into their listing (read: translates to great reviews and more money!). As I mentioned, what made me decide to get into hosting was love and possibility, and so I try to keep those values aligned in how I transmit information through The Abundant Host. ZM: You also wrote a book! A challenging feat that I have wanted to do but have not yet. Where was that idea born from? AH: Ah yes! It is like, niche within niche. It’s called: “Cleaning Up: How to Work With a Turnover Assistant to Uplevel Your Profit, Freedom and Success Hosting on Airbnb.” And it’s all about step-by-step how to hire what I call a “turnover assistant” to enhance your success. I believe (and I know you do, too!) that finding help in the form of assistants is one of the most efficient ways to maximize your business by helping you focus on what’s most important: growing your business. In the world of Airbnb, the equivalent to this much-needed form of help is finding an awesome turnover assistant. I know there are plenty of services out there that send different people to your home, but, in keeping with my thoughts on human-to-human interaction, I believe in hiring one person who knows your home inside and out. A turnover assistant is more than a cleaner and brings in some qualities that a “home stager” from the real estate world might have. Say for example a guest moves a table, rearranges some decorations, even moves plants (I’ve actually had this happen before! )—this one person intimately knows your home and will see that immediately. Someone who’s never been there before will never know this, especially if you have a larger home with many decorative and intentional pieces. I believe that once you get to this level, your success through Airbnb is directly affected by the quality of work your assistant does. I wrote this book to walk people through how to find the perfect turnover assistant—like really deep-level nitty-gritty stuff, conscious communication tips and everything. Because, well, that’s very me. ZM: You have some unique offerings on your site. Tell us more about the Exclusive Listing Spotlight, and why people might want to open their home to The Abundant Host? AH: This is my most “bespoke” and immersive offering, and I love doing it! It’s my favorite thing. I come directly to an Airbnb host (by car, plane, ferry, what-have-you) and I get a chance to fine-tune everything from your pre-check-in + booking process all the way through to check-out. Warning: This is not for the faint of heart! I’m an ex-editor from the print journalism world, so I’m pretty shrewd. Usually (but not always), people who have larger spaces or who are asking very high amounts for their unique spots are the ones who approach me for this kind of consulting. I provide a thorough and in-depth review from my in-person stay (usually I’ll stay for 3-5 nights—or longer, if the host wants me to create a town/neighborhood guide for them as well) and give them advice I could never give without having seen the space in person. Imagine me as a Marie Kondo on the new Netflix series, whirling through your home and helping you make it the absolute best listing it could be. ZM: I hear you have some exciting projects in the works for 2019. Can you give us a sneak peak? AH: I do! I have both a (free) Challenge and a (paid) Course coming up and they are both super exciting for me. The first iteration of the Challenge will be in Feb. 2019, it’s completely free to join, and it’s called, “Start from the Heart: A 7-Day New Host Challenge.” I know there are plenty of blog posts and courses out there with thorough technological and logistical walk-throughs of starting up a listing. But, a large percentage of us don’t need to necessarily be walked through every step on a screen and directed to hit every “Next” button—what we do need help with are the things like conscious sales techniques, and that which will bring about deeper connection (and therefore higher booking rates/income)—storytelling. Starting with this challenge, you’ll get a core understanding of what you’re offering so that you can attract exactly the guests you desire, plus insight on how to respect and integrate guests into your local culture so that Airbnb can continue even being a thing you’re allowed to make money with. The more positivity we can bring to hosting, the more our neighbors see that our guests are actually boosting the local economy as opposed to ruining it, the more money we make and the more positive changes we can make in the world. This sets you up for the long-haul. The second course I’m working on is for the seasoned host, and it’s called: “Room to Roam: Give Guests What They Crave For Rave Reviews & Sky-High Income.” This is an in-depth paid course that dives much deeper into what a guest really wants when they’re traveling, and how you can provide that for them (which translates to better reviews/income for you) using the Abundant Host mindset. It’s a really unique and heartfelt course perfect for the intermediate or advanced Airbnb host who has noticed a slow-down in their bookings, who needs a bit more help in making the kind of income they want, who is finding they’re attracting the wrong kinds of guests, or who wants to start new listings and do it in a way that is intentional and respectful of the community and environment (read: you’ll be able to do it longer!). Thanks Amy! If you want to contact her, head over to The Abundant Host and use her contact form.